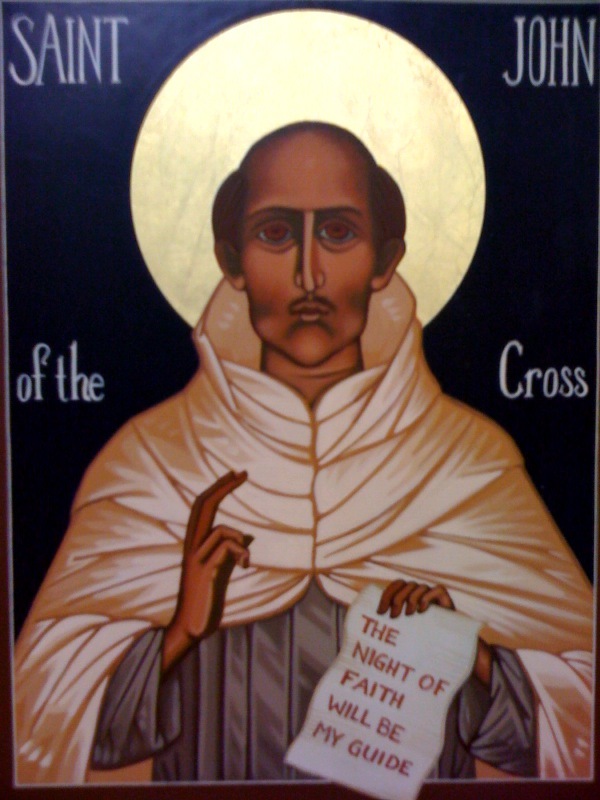 The poem, Dark Night, is the basis of two of John’s major works, the Ascent of Mount Carmel and the Dark Night. Though separately titled they form one work. Ascending Mount Carmel is John’s metaphor for the journey into union with God. John describes three ways to the mountaintop of union with God. Two of them are broad roads to the left and the right. These are “the ways of the imperfect spirit” consisting of the pursuit of earthly goods on the right and the pursuit of heavenly goods on the left. Seekers who follow these broad roads become attached to earthly or heavenly goods. However, the goods are not God. Only the narrow center “path of the perfect spirit” leads to divine union. The apophatic nature of John’s theology and spirituality is made explicit in use of the term “nada” (nothing). The Ascent explains the path one must follow in order to reach union with God. John wrote out of the sadness that he felt that so many failed to advance because of what he calls darkness and trials. A person must pass from an initial state of disorder, along the way of faith, to God, the goal of every human being. John concludes that the entire way to union with God can be called a dark night because, just as in darkness there is a privation of light, this way demands privation. The Ascent deals primarily with the active nights of sense and spirit. Individuals must deprive themselves of the gratification of their disordered appetites and journey in faith deprived of light. They will thereby reach God whose brightest light is total darkness to us in this life. The Dark Night deals with the passive nights of sense and spirit. We must remember, however, that the active nights and the passive nights are not two separate paths. Rather, they are two aspects of one unique active-passive journey to God. The poem describes two fundamental conditions in the spiritual process: the painful passage through the night, and the unspeakable joy of encountering God. John does not prescribe a specific program of detailed asceticism. Rather, he emphasizes allowing God to lead. John uses two allegories to illustrate the purifications. First he speaks about God as a loving mother who first nurses her child, carries and caresses it in her arms, but who then must wean the child, teach it to walk on its own, and finally to put aside the ways of childhood. Second, in the purification of the spirit God’s action is likened to fire working on and transforming a wood log. The spiritual journey to union with God is an ongoing work of purification, cleansing of all that is repugnant to God’s holiness. This implied purity requires personal effort. However, no matter how intense this personal effort is it always insufficient and cannot achieve the radical stripping away demanded by the union. God’s intervention is necessary through a passive purification that is beyond what human effort can achieve. Human effort does little more than dispose one for the divine purifying action. The negation of the dark night is in reality a theological communication. The apophatic way is not simply the idea that language is inadequate. It is not finally about absence and negation. In a paradoxical way there is presence in the absence of apophaticism. The emptying and stripping away is transformed into the fullness and presence of the divine in union with the human. John describes the dark night experiences as a painful lack or privation – darkness in the intellect, aridity in the will regarding the exercise of love, emptiness of all possessions in the memory, and a general affliction and torment as a consequence. These are the result of contemplation. For John contemplation is the in-pouring of God into the soul, a divine, loving knowledge that is general, without images or concepts, obscure and hidden from the one who receives it, a knowledge that both purifies and illumines. The dark night leads to a new self, divinized in being and operation, now living a life of faith, hope, and love. Up until John’s time the spiritual journey was generally understood in three stages: beginner, proficient, and perfect. These stages correspond to the three phases of spiritual growth, purgative, illuminative, and unitive. These stages were considered important but the transitions from one stage to the next were not. The the points of transition were seldom discussed. John accepts the three classic divisions but introduces a new way of understanding them. John’s personal experience, especially his time in prison, taught him that the painful experiences of life are often the moments of greatest grace and progress. John named these painful transitional experiences “nights.” John’s writing tends to emphasize the transitions rather than the stages. John identifies three signs that one is entering into a night of transition: 1. an irresistible drawing towards more quiet in prayer, 2. a mysterious dryness which affects all aspects of our life and especially our usual spiritual practices, and 3. a great deal of anxious concern about what is happening generally and specifically regarding our relationship with God. Obviously, these signs cannot be applied as a checklist but must be discerned under the guidance of competent spiritual director. Related post: St John’s sketch of the Crucifixion. Thanks for this outstanding and very informative post. Joe, thanks so much for your comment. For me St. John has been and continues to be an important guide and teacher. Peace. i finally found a saint to whom i have honored by putting up a pre-school and probably in the future expanding it into high school. i have been searching a name for so many years to give the glory and prainse to God in my own simple way of spreading the mission and vission of one of the greatest saints in modern history. also it is one way of giving back the love of my early introduction to the carmelite community where in i spent the early years of my schooling and my profound gratitude to the discalced carmelite missionary here in the Philippines. also as a feating tribute to all Filipino citizens who are associated in their life.